South Africa’s gold production has plummeted 85% over the past four decades, with the country now ranked as the world’s eighth-biggest gold producer, according to information services firm Thomson Reuters’ GFMS Gold Survey 2018. The country’s gold mines are the deepest in the world and their depleting orebodies are becoming increasingly difficult to extract. Coupled with deteriorating safety standards, owing to the depth and complexity of these mines, and compounded by regulatory issues, the volatile rand is creating significant headwinds for all the country’s gold producers. To face some of these headwinds, local gold producers have been restrategising through the implementation of new technologies, while others downsize, cut lossmaking operations and/or strategise through acquisitions to cut costs and improve productivity. 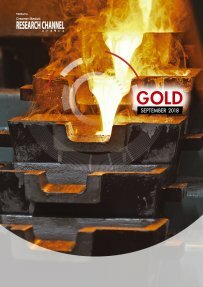 Creamer Media’s Gold 2018 report reviews the South African gold market in this context, with a particular focus on supply, labour challenges, the class law suits that some of the country’s major gold miners are facing, safety issues and prospects for the market. It also reviews the major and smaller mining companies with operations in South Africa. Published on: 01 October 2018.